5 years ago while watching a video about wire crochet, Pam discovered the Peruvian Stitch technique. Two years later, Pam travelled to Peru and took classes from the experts to become a professional in the Peruvian Stitch. 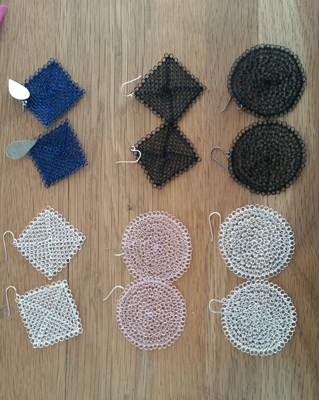 “Peruvian Stitch technique allows you to form symmetrical rings and achieve beautiful jewellery”. Pamela loves the flexibility that comes with her business, as it allows her to be at home with her three children. Pam uses non-tarnish, Sterling & Fine 99.9% wire.